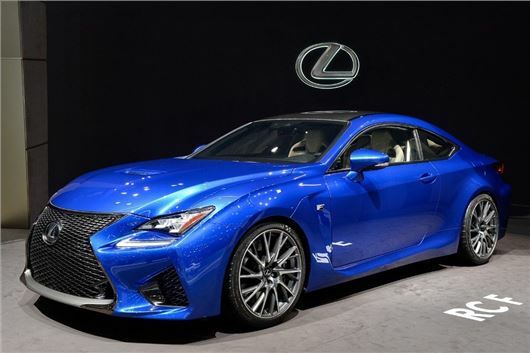 The Lexus RC F made its European debut at the Geneva Motor Show. It's based on the forthcoming RC Coupe and is powered by a 5.0-litre V8, which will have more than 450PS and 520Nm of torque. The RC F is the first F model from Lexus since the IS F went out of production in 2012. No performance figures have been released, but Lexus has confirmed a top speed of 168mph, but we can expect a 0-62mph time of around 4.0 seconds, putting it toe-to-toe with the upcoming BMW M4. The V8 engine has been developed specifically for the RC F and Lexus says that every aspect has been designed to deliver the highest possible driver engagement. This includes a specially calibrated eight-speed Sports Direct Shift gearbox along with a new system that regulates induction and exhaust sound, creating a deep tone up to 3000rpm, with a higher-pitched note as revs rise above 6000rpm under acceleration. Along with a torque vectoring differential, the RC F comes with an active rear wing. This is built into the boot and creates additional downforce at speeds above 50mph. To make the RC F stand out from the standard RC it comes with a higher bonnet with an air vent, ten-spoke 19-inch alloy wheels and dual twin exhausts. Carbon fibre is used in the roof, bonnet and rear wing to keep weight down. Although final details haven't been revealed, it's expected to go on sale in the UK in early 2015 at an expected cost of around £55,000.